Sales opportunities are passing you by everyday! How many vehicles pass by your business per day? Each of these vehicles carries potential customers. Studies have proven that the most effective way to interact and maximize this revenue is to connect with these customers through an electronic message center (EMC). We always hear the phrase “location, location, location” when searching for business real estate. People are willing to spend more on the property with the right “location”. Appraising the value of your signage is also an important expenditure. A business could have a great “location” but without a “sign”, your audience will not even know that you exist. A business without a sign is a sign of no business! Thus, the new catch phrase should be “sign, sign, sign”. Times are changing and your competition is vying for your share of the market. So how do you differentiate your business from your competition? As a business owner, it is essential to interact with your market and keep up with the changing times. An electronic message center is the answer. Think of how a small delivery business operates. They need a mode of transportation to deliver their products; a truck, van or car. They would not think twice about this expenditure as it is an essential part of their business. They could have a fleet of bicycles, but it would only work for a very small market segment, thus limiting their potential. 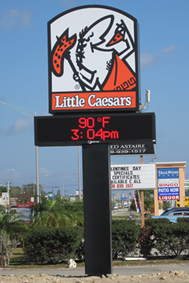 An electronic sign for a retail business is as essential to a retailer as the truck, van or car to the delivery business. The EMC will deliver your name, message, promotions, and branding 24/7. Your audience can’t avoid seeing it. The sign will be noticed and create an immediate impact on your return on investment. Your “package” will be delivered and you will get “paid” for the delivery! There is a common misconception that electronic message centers cost too much. In reality, it is costing your business too much by not having one! To appraise your EMC signs worth is not just appraising the cost of the cabinet or “box”. It must be appraised by the message, visibility and its branding aspect to determine its value. Without the electronic sign, you are losing impulse traffic, lost or no memory of your business and loss of your branding which all result directly in revenue loss. If you regard the sign as an empty “box” with no message, it is not worth anything to your business. But when the sign is up and running promoting your business, advertisements and branding; now you have your “sign, sign, sign”!